"Should the Captain be as successful at Chicago as he is in New York, he will come off victorious in a great majority of his encounters with chess luminaries of that city." "In this connection it is proper to [illegible] very briefly the somewhat eventful life of the gentleman who claims to be the chess champion of America. he is about 35 years of age, a Scotsman by descent, and formerly a Captain in the British army. During the progress of the rebellion he came to America, and engaged as a Captain in the Union forces. He was through some three years in the South and was one of the few who, though seeing much hard fighting, fortunately escaped uninjured. He returned to New York city and at once became a prominent member of the chess club there, having some years before been one of the most noted players in Great Britain and competent to play on even terms with the ablest practitioners in Europe. Since the war he has been acknowledged leader of chess in New York, and has defeated Mr. Lichtenhelm, formerly of that city, and Mr. Reichelm of Philadelphia, in set matches......Undoubtedly the visit of Captain Mackenzie to the West will occasion a great amount of excitement and play, and an opportunity will be afforded the Western players to see if they can make any stand whatever against the redoubtable New Yorker. Of course, the chances are largely in his favor." 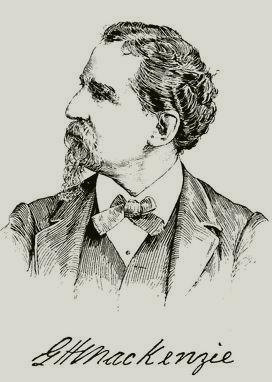 Mackenzie played a match against Frederick Bock, who in 1874 would place fourth (4 points) at the Third American Chess Congress held in Chicago, which was won by Mackenzie (8 1/2 points). Bock was attached in some capacity to the Lawrence Barrett Dramatic troupe. as a man of great wealth, who used to be one of the strongest players of the city, and was by far the most deliberate player in the city, but he had given up chess completely by the time of the American Chess Magazine ( August, 1897) article. Morgan served at one time as the President of the Chicago Chess and Checkers Club. He was on the Chicago team, that played the Quincey, Ill. team by telegraph, which was the subject og two previous posts, Links here and here. And finally Mackenzie also played matches against Henry Hosmer and Hiram Martin Langdon Kennicott, Hosmer was the subject of a previous post in this blog. Kennicott had played at the First American Chess Congress in 1857, not advancing beyond the first round losing to Benjamin I. Raphael (3.5 - 2.5). 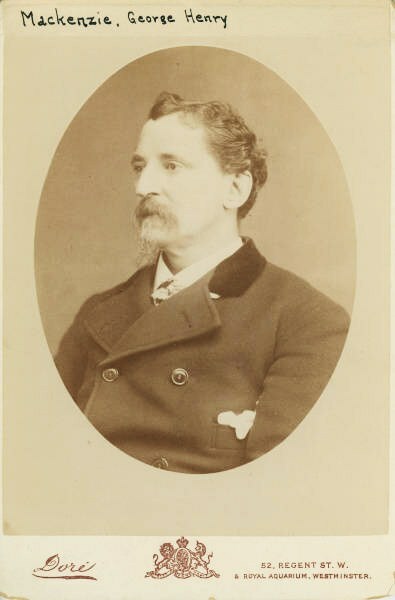 Kennicott would take part at the Third American Chess Congress in 1874 , but would withdraw early from the tournament. The chess column of February 18th in the New York Spirit of the Times gave the results of Mackenzie's visit to Chicago, in his match with James Morgan each player won 3, with 1 drawn game. In his match J. (?) Hosmer, Mackenzie won 3, and losing but 1 game. Mackenzie won his match with Frederick Bock by same score as his match with Hosmer. Mackenzie shutout Hiram Kennicott in their match, winning 2, with no loses or draws. In December, Mackenzie again would find himself in the West in Cleveland for the Second American Chess Congress, it was originally thought that an International tournament could be organized, but the majority of the western players preferred a purely American affair, Mackenzie would win the tournament and he would continue to dominate the American chess scene for years to come.